Formula 1 team Toro Rosso has announced the signing of a contract with Daniil Kvyat. The 19-year-old phenom may be the biggest Russian name in the sport, but he’s not the first one. The 19-year-old Ufa native was the first Russian to make his way to Formula 1 not through money but by sheer talent. Kicking off the GP3 Series season on a less than fortunate footing, he later completed several impressive races and is now vying for the title of champion. Kvyat has followed in the footsteps of Russian tennis players, almost all of whom lived and trained abroad and achieved success with only periodic visits to Russia. He lives in Italy, can speak several languages, and has no trouble understanding the instructions of engineers. But most importantly, Kvyat is part of the Red Bull Academy for youth, which prepares young talent for serious races. 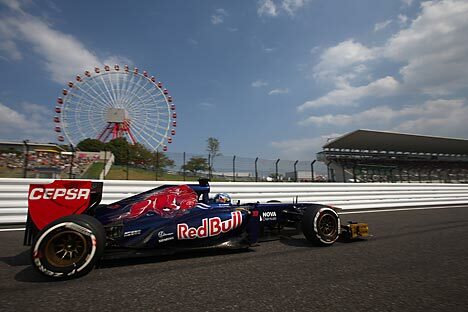 The Toro Rosso team is, after all, a subsidiary of the Red Bull Racing team, which means that Kvyat has a chance to partner with Sebastian Vettel, who is close to becoming a four-time world champion. The first of the Russian drivers was Sergey Zlobin. Attempts were made to promote him to Formula 1 with the use of money from Gazprom’s coffers. The Russian company became Minardi’s sponsor in August 2002 and the negotiations were brokered by manager Oksana Kosachenko. When the contract was signed, it was announced that a Russian driver would sit in the cockpit. Gazprom, which paid $2 million of the $9 million it promised in the first season, later unilaterally severed the contract. Zlobin found himself a hostage to the situation and did not receive a Super License to participate in the Grand Prix. The Russian did not have any other options but to pilot as a rent driver, since he could not boast of any serious accomplishments in the racing world. Later Zlobin slipped into obscurity. He popped up in news reports again in 2007, when he survived a bomb planted in his car. However, even though Roman Rusinov accomplished impressive feats in his career, he did not make it to the Grand Prix. Rusinov did not have Russian sponsors who could help him secure a driver’s spot on the Midland team. The team belonged to Alex Schneider, a Canadian billionaire of Russian origin, who bought it from Eddie Jordan and renamed it. The businessman was counting on help from sponsors from Russia (the team performed under a Russian license), but he miscalculated. Within a year and a half, Schneider had sold the team, recouping his investments in Formula 1 with difficulty. In contrast with Zlobin, Rusinov had a Super License. However, he proved that he could manage just fine without Formula 1 with a series of successes in endurance racing. “If there were a proposal right now, I would think about it carefully. I wouldn’t change my place on my current team G-Drive in races for survival even for a spot as lead pilot on one of the worst teams. That kind of exchange wouldn’t be interesting or beneficial for me,” he said. Oksana Kosachenko’s second attempt to promote a driver to Formula 1 succeeded. All of the factors converged, and of course Petrov was a better driver than Zlobin. With the support of Russian sponsors and his father – one of the directors of the Vyborg Shipyard – he signed a contract with Renault at the end of 2009. The French giant’s close cooperation with Avtovaz also played a role. Petrov spent two seasons at Renault. He took third at the Australian Grand Prix in 2011, but in the end he was dismissed from the team. One of the main reasons behind the rift in relations was Petrov’s sharp words about the team and Renault’s bet on French driver Romain Grosjean and oil giant Total. Petrov spent 2012 on the Caterham team and won an internal duel against prominent Finnish driver Heikki Kovalainen, but he was forced to leave F1. Later, he severed all relations with Kosachenko, as well. All told, Russian sponsors paid around 40 million euros for Petrov’s participation in F1, but not a single one of them received a notable commercial benefit. At the end of August 2013, Sergey Sirotkin, at just 17 years old, set an absolute Formula 1 record. He became the youngest pilot in the history of the Grand Prix to sign a contract with Swiss team Sauber. This team suffered serious financial problems, which were solved with the help of three Russian companies: the National Institute of Aviation Technologies, the State Fund of Development of the North-West Russian Federation, and the International Cooperation Investment Fund signed a 380-million-euro contract with Sauber. In exchange, they placed their driver in the cockpit of one of the strongest average performers in racing. This season, Sirotkin has mounted the podium twice in the World Series by Renault, but he is only ranked ninth overall. However, Sirotkin’s potential means that there is still a chance that two Russian drivers will compete next year at the start of the Russian Grand Prix in Sochi.